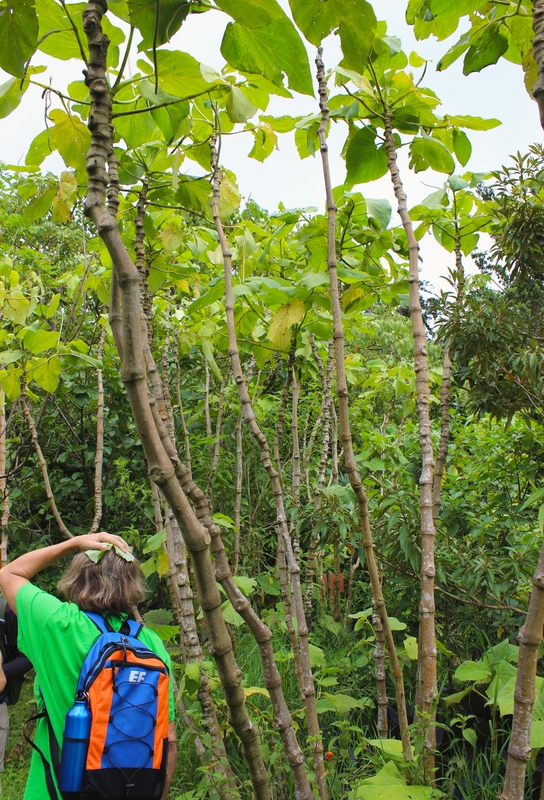 Doubling as a fashion accessory when crumpled slightly and placed on the head, piper auritum is a favorite of tourists visiting the UGA Costa Rica San Luis Botanical Garden’s medicinal plant garden. Anisillo, as it is referred to in Spanish, belongs to the Piperaceae family and is endemic to the Americas, spanning from Mexico to areas of South America. The plant generally appears as a smaller tree exhibiting stems with sometimes-swollen nodes and large leaf scars. Anisillo typically grows to about 6 meters high. After crumpling the leaves, feel the cooling relief it provides by pressing it against your forehead or on top of your head. You will find that it is especially effective in aiding headaches brought on by long periods of sun exposure. Crumpling the leaves of piper auritum gives off what many say resembles the smell of root beer. Beyond its principal use as a headache helper, it can be brewed in an infusion to help soothe stomachaches, toothaches, and pain caused by arthritis and rheumatism.